September is the perfect time of year to be dividing up your perennials and, as I am regularly asked by clients how to do this, I thought I would give some advice on it this month. There are a few simple rules, but if you follow them you should be able to revitalise your border and your plants. Perennial plants, those that come up each year and flower, usually grow by spreading outwards. These plants are sometimes referred to as “cottage garden plants”. After three to five years, depending on the variety of plant, many of them outgrow themselves with a result that the centre of the plant looks rather sparse with fewer leaves and the whole plant doesn’t flower as well as it used to. There can also be an issue with overcrowding where one flower in the border has grown into an adjoining plant and become all tangled up. The simple solution to this is to divide up the perennial border. This is done by digging up all the plants you want to rejuvenate, splitting them into several smaller plants and re-planting the best looking parts. As I’m sure you are aware, this also gives you lots of new plants, either to use in other areas of your garden or to give away to friends with a new border to establish. 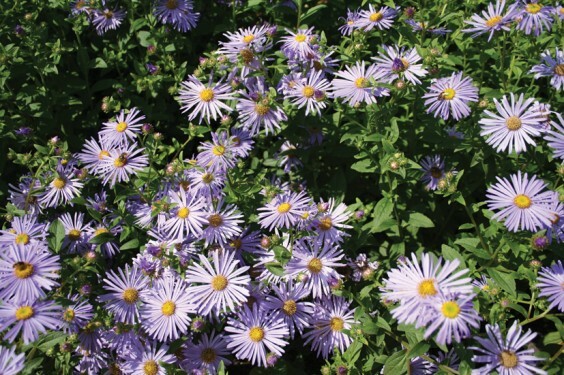 The easiest way to split a large perennial is as follows: once the whole plant has been dug out, lift it into a position that you can manoeuvre; it’s a good idea to lay it out on a heavy duty tarpaulin or similar. Remove as much of the clinging soil as you can to see the root system. Take two garden forks and put them into the plant back to back. Push one fork against the other, allowing the action of the forks to rip the plant roots apart. This may sound and feel dramatic but it really does work and the ripped roots soon recover, in fact the plants seem to love this treatment and once put back will flower for you better than ever. At the same time as splitting up the plants, you also have an opportunity to remove any pernicious weeds that have got entangled in the plant roots. Split the plant into several good sized clumps, not too small – as a rough guide, with most plants the new clumps should be around the size of your hand. Replant the outer, younger sections of the perennial and not the centre, which is older and will not flower so well in subsequent years. While you have the opportunity, add plenty of well-rotted compost or manure to the tired soil and water the newly planted perennials into place. Most fibrous rooted plants will respond really well to this treatment and reward you with another five years of colourful display, but there are a few cottage garden perennials that need a slightly different treatment when they have very dense roots. One example is Hostas that have overgrown – dig them up as above and where the plant has very dense, fleshy roots use a sharp spade to slice through and divide the plant. It sounds dramatic but works well; just make sure you leave around six growth points on each new plant. Only do this dividing on plants that have finished flowering and when the soil is damp and easy to work – so it may be late September if the early autumn has been very dry. As a last point, there are some perennials that don’t respond well to being divided and these include aconitum (Monkshood), dicentra (Bleeding Heart), peonies and poppies. Otherwise, this is a good trick for increasing your stock and revamping your tired border.